In 1515 William earned his Master’s Degree from Oxford University at the age of 21. In 1520’s William became the tutor in the family of a man named Sir John Walsh in Gloucester. William served as a tutor to the Walsh children. It was there he began to study Erasmus’s Greek New Testament which had been printed in 1516. He began to devote Himself to understanding the scriptures in the original languages. He was a very gifted linguist that he knew eight languages: Hebrew, Greek, Latin, Spanish, French, Italian, English and German. It was said of William by those that knew him that he was “so skilled in eight languages…that whichever he speaks, you might think it his native tongue.” Many have even deemed Tyndale the “Father of the English language.” As he began to study the scriptures for himself in the original languages he began to become increasingly disdainful to many of the things that he saw and heard taught within the Catholic church. He soon began to discover that many of the clergy cared more for money, power, prestige, and luxury often at the expense of their poor parishioners, than they did for Christ. Tyndale often accused them of robbing from widows, stealing from the poor, keeping people in ignorance, and teaching false doctrines to enslave, control, and manipulate the people for their own purposes. Before William Tyndale came along there was a man by the name of John Wycliffe that cut the path for Tyndale to follow in years before. For John Wycliffe was the first individual to complete a English translation of the Bible. The difference between Wycliffe and Tyndale is that Wycliffe translated the English Bible from the Latin Vulgate that was translated by Jerome in the 4th century. Whereas Wycliffe’s translation of the English Bible was from Latin to English. Tyndale on the other hand translated the original languages of Hebrew and Greek into English. Tyndale was also at a great advantage as well, for when Wycliffe translated his Bibles each manuscript had to be handwritten out. Yet for Tyndale with the invention of the printing press mean that he could make his English transition in mass quantities by the thousands. In fact, with the invention of the Gutenberg Press in 1436 it made printing of materials such as the Bible to be spread across Western Europe feasible and accessible. By the years 1500 the printing presses in Western Europe had already produced nearly twenty million volumes. In the 16th century with the printing press spreading out further the output of printed material rose to nearly 150-200 million. However, in 1408 the church had banned the unauthorized translation of the Bible into English and could mean death or confiscation for anyone who owned one. Therefore, this would be a very difficult and dangerous task, and one that would eventually cost Tyndale his life. Mr. Walsh was a very generous and wealthy man and would often entertain local clergy from the Catholic church at his home to eat with his family. Tyndale would often engage in conversation with these clergymen and would often confront them in their Biblical ignorance. One time in a conversation over the dinner table a clergyman from the church in revolt to Tyndale said, “We are better to be without God’s laws than the Pope’s.” In response William made his famous statement “I defy the Pope and all his laws. If God spare my life ere many years, I will cause the boy that drives the plow to know more of the scriptures than you!” This would become the God driven desire of William for the rest of his life, that the English speaking people would have a Bible in their own language. Perhaps Tyndale was inspired by his mentor Erasmus who also said, “Christ desires his mysteries to be published abroad as widely as possible. I would that the gospels and the epistles of Paul were translated inall languages, of all Christian people, and that they might be read and known.” The problem was that it was illegal and to attempt to try could mean death. Tyndale went to London to Bishop Tunstall to see if he would authorize an English translation of the Bible, to which the Bishop refused his idea. However, he would not let the rejection of man deter him from what he believed God called him to do, in making an English translation of the Bible. With the support and encouragement of some British merchants, Tyndale decided he would go to Europe to make his English translation to have it printed and them smuggled back in to England. So, in 1524 Tyndale set out for Germany. It would be in the town of Hamburg that Tyndale would work on his English translation of the New Testament. In the city of Cologne he had found a printer who was willing to print his English translation. However, news of what Tyndale was doing was found out the press shop was raided. By the sovereign hand of God, Tyndale managed to escape with the pages of his New Testament just printed and made his way to the city of Worms. It would be in the city of Worms that his New Testament into English would finally be published in 1526, this would be the first Bible translated in the English language. Knowing the book was banned in England he began to hide them in bales of clothe to smuggle them into England. Taking full advantage of the printing press Tyndale could produce mass volumes of these translations to be dispersed. By October of 1526 over 6,000 of Tyndale’s English New Testament were in the hand of the people and they were reading them. When the bishops of the church found out about Tyndale’s New Testament they did all they could to destroy the Bibles. Bishop Tunstall hated the fact that people could read the Bible on their own which would expose their hypocrisy, so he conspired with Sir Thomas More about getting as many of Tyndale’s Bibles as possible and destroying them. In fact More said of Tyndale’s translation, “not worthy to be called Christ’s testament, but either Tyndale’s own testament or the testament of his master Antichrist.” They approached a merchant in Antwerp about buying as many as they could. The merchant, whose name was, Augustine Packington was a friend of Tyndale and told him of the offer. 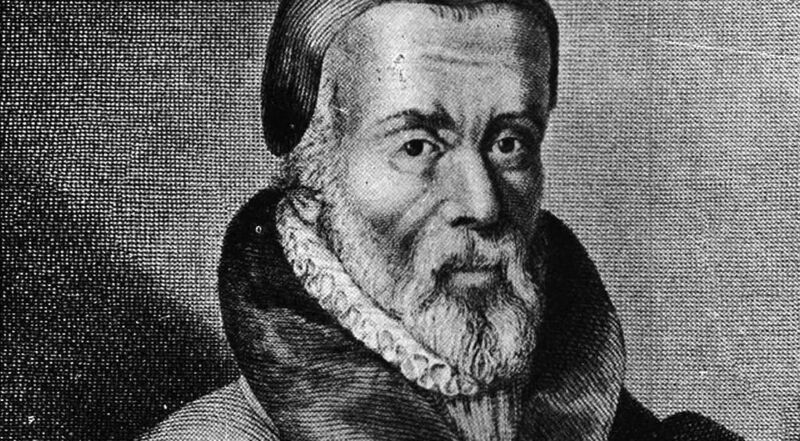 Bishop Tunstall bought all of Tyndale’s Bibles that had been printed up to that time and he burnt them. In turn Tyndale took the money used to destroy his Bibles, to use in the making of more of his Bibles. The money received from Bishop Tunstall allowed Tyndale to print off Bibles of better quality. In the 1530s an English merchant named Stephan Vaughan was commissioned to find William and tell him that King Henry VIII to return from hiding. The king wanted Tyndale to serve as his writer and scholar. Tyndale expressed the fact if the King of England would not allow a Bible in the English language to be translated then he would not return. The king refused and as a result William never returned to his homeland again. Tyndale continued to remain in hiding translating the Old Testament while the agent’s of the king searched all over England and Europe to try and find him. For nearly nine years he managed with the help of friends to evade authorities which gave him the ability to work on his translations. In 1534 Tyndale published a revised version of the New Testament and before he was killed he went on to translate from Hebrew into English the Pentateuch, Joshua, Judges, Ruth, 1 &2 Samuel, 1 & 2 Kings, 1 Chronicles, and the book of Jonah. Only the Pentatuch in 1530 and the book of Jonah in 1531 were published in his lifetime, while the rest of his Old Testament translation material became the basis for what became know as the Great Bible by Miles Coverdale in 1535 which was the first Bible that contained the full Old and New Testament in the English language from the original languages. His translations also formed the basis for all the other major Bibles that were published after including the: It also was the basis for the “Matthews Bible” in 1537, Taverner’s Bible 1539, Geneva Bible in 1557, which was referred to as ‘The Bible of the nation’ and sold over a million copies from 1560 to 1640. It was also the basis for the 1611 King James Bible and the English Revised Version 1885. Dr. Dan Wallace, professor of New Testament studies at Dallas Theological Seminary stated that over 90% of the King James Bible is a translation from Tyndale. After an examination was done on Matthew chapter 5 between Tyndale’s translation and King James it was found that of the 1,063 there were only about 108 differences. The Tyndale translation also constituted about 75% of the Revised Standard Bible as well. Today there is only one complete copy of the first edition that is known to exist, and the British museum paid $2 million for it in 1948. Tyndale was eventually caught when he was betrayed by a man posing to be his friend named Henry Phillips and turned him over to the authorities. After a year and a half in prison he was finally brought to trial and was charged with heresy. His heresy was that he translated a “corrupt” version of the Bible. In August of 1536 he was condemned and set to be burned at the stake on October 6, 1536. As the local officials came that day and took their seat around the stake in the middle of the town, Tyndale was given a chance to recant. He refused to do so and instead he prayed “Lord, open the King of England’s eyes.” Soon after he was bound by an iron chain and a rope put around his neck. They then took gunpowder and poured it upon the brush and logs that surrounded him. At the signal the executioner tightened the noose around his neck, strangling him, and then setting his body aflame. Tyndale’s last prayer came true in part when three years later King VIII required every parish in England to make a copy of the English Bible available to it’s parishioners. Although he was well educated with a masters from Oxford, financially stable and a social elite, he could have chosen a life of ease and luxury. Instead he chose to go where God led him and that is a life of conflict and sorrow, and death. Yet in his sacrifices he changed Europe and nearly 500 years later his English translation is still changing the world. Tyndale once said in a letter he wrote, “I call on God to record against the day we all appear before our Lord Jesus to give a reckoning of our doings: that I have never altered one syllable of God’s Word against my conscience. Nor would I do so today, if everything on earth was given to me; no matter what kind of pleasure, honor, or riches it might be.” Today if you own an English Bible, say a prayer thanking God today, that God raised up a man like William Tyndale, who gave his life that you might might have a Bible in the English translation, and may you never take your English Bible for granted.